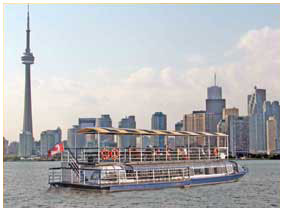 The Harbour Star is a 70 ft / 21.3m, 100-passenger touring vessel that has guided hundreds of thousands of tourists and locals through the Toronto harbour and islands since arriving at its current berth at Harbourfront Centre in 1999. Three distinct seating options are available. 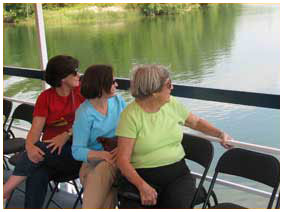 You can sit on the upper deck of the boat. This fully-unobstructed upper deck is the only one of its kind in Toronto, affording passengers a 360-degree view of the skyline and some of the city’s best photo opportunities. There is a canopy on this level that provides protection from the sun and rain. Another seating option is the wraparound outdoor deck located slightly above water level. Passengers looking for some sunshine usually find a cozy seat here where they can relax and watch the waves lap up against the side of the boat. The naturally-lit interior of the Harbour Star is laid out in bistro style and features tables and cushioned chairs as well as restroom facilities. Kick back and enjoy a cocktail here and watch the captain navigate through the harbour and into the canals and lagoons of the islands. The Harbour Star spends about half the cruise exploring the Toronto Inner Harbour and the rest of the time traveling through the canals and lagoons of the 14 Toronto Islands. There is a tour guide on board the boat who will deliver a fun, friendly, and informative commentary as the boat winds its way through the harbour and islands. This official City Sightseeing Toronto guide would be more than happy to answer any questions you might have and to offer thoughtful advice on how to make the most of your stay. 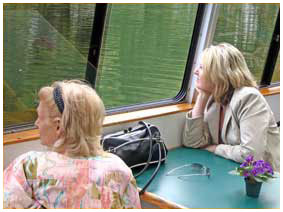 The harbour and islands cruise is available from May through October. The cruise lasts 45 minutes. In the summer season, the first tour departs at 10:30 am. In the spring and fall seasons, the first tour departs at 11:30am, weather permitting. Please contact us as your travel date nears for the most current departure information. Note: Rates do not include sales tax of 13%. Rates are subject to change. Children 0-2 years of age are free. 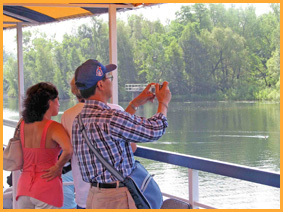 The cruise features a live guide delivering an entertaining and informative commentary as the boat winds its way through the Toronto Inner Harbour and the 14 Islands. Three distinct seating options are available: outdoors under the canopy on the upper deck, outdoors on the water-level sundeck, and inside at tables on the lower level. The lower level also houses washrooms and a bar. 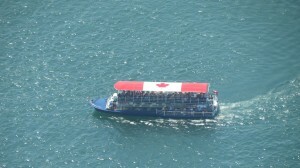 The harbour and islands cruise is available from May through October. The cruise lasts 45 minutes. Please feel free to contact us as your travel date nears for the most current scheduling information. Please note that the free harbour and islands cruise is seasonal, and this bonus trip is only available until Oct 31st, weather permitting and subject to the captain’s discretion. 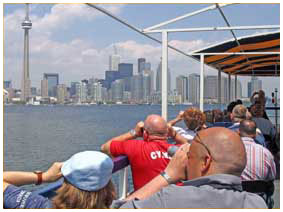 CitySightseeing Toronto tickets purchased after this time will still include the free harbour cruise passes, and these passes can be retained and used when the boat resumes operating the following spring.